Imagine mountains protruding from crystal blue waters, sandy beaches with magnificent rock formations, abundant wildlife, and fishing second to none on the coast! Welcome to Reel Obsession Sport Fishing. Enjoy a relaxing stay at our oceanfront fishing resort on Vancouver Island's spectacular northwest coast. 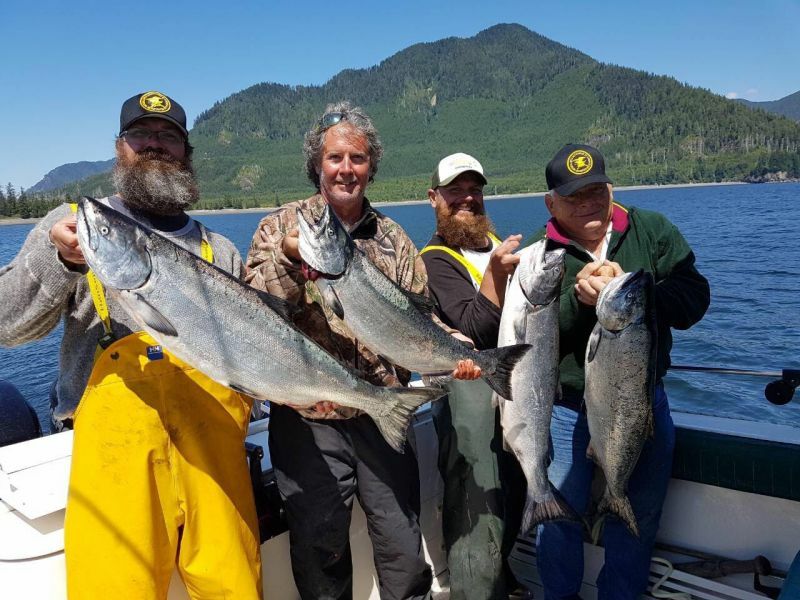 We provide Vancouver Island Fishing Charters, wildlife eco tours, accommodations and gourmet meals at one of the best lodges on the west coast of British Columbia Canada. Millions of fish live and pass through the waters of Esperanza and Nootka Sound giving us some of the best salmon and halibut fishing in Canada. Join us for an amazing Canadian fishing trip at our resort in beautiful Zeballos BC. At our lodge you'll be treated like family. Relax after a day on the water in our hot tub and sauna while enjoying the breathtaking view of the inlet - all in one of Vancouver Island's hottest fishing spots. The season is from June 1st until the end of September. Salmon and halibut fishing around Zeballos, Nootka Sound, and Esperanza is some of the most consistent in British Columbia. Many British Columbia fishing lodges only experience good fishing for a few weeks each year – we send guests home with limits of salmon, halibut, and ground fish all season long. You'll enjoy a world-class fishing at a price that is very competitive. Having the option of the easy drive to our front door only 2.5hrs from Campbell River allows us to keep our prices economical while still offering a first class experience. Our packages are a great value compared to the Queen Charlotte Islands or Alaska. Please check out our rates and compare. From an afternoon fishing charter in Victoria to a corporate getaway at the lodge in Zeballos, we offer packages that can be customized to suit your needs. The Lodge is located in the seaside village of Zeballos BC on Vancouver Island's west coast. Accessible by automobile or float plane our resort is a great spot for a corporate retreat, a family vacation, or the Vancouver Island fishing charter of a lifetime. You will enjoy all the comforts you'd expect from large resorts; a hot tub, sauna, satellite TV, and in-room fireplaces. Wireless internet, telephone, and a fax machine is provided for those of you that need to stay in touch. Incredible scenery surrounds the lodge and the fantastic food prepared by our chef make for an unforgettable fishing experience. June, July and August are Sold Out! Vancouver Island Fishing at it's Finest!